Everybody wants good food and at a decent price. If we are going to have a treat that does not mean we have to break the bank. But naturally we are all a little worried about getting something for a treat on the cheap and it just being a huge disappointment. 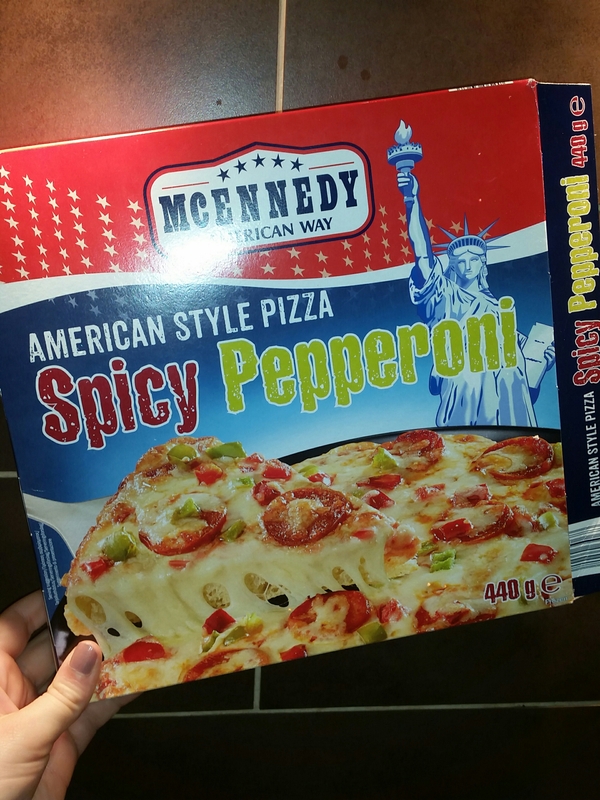 So what about the Mcennedy’s Spicy Pepperoni Pizza from Lidl? For 89p you get a decent 440g of carby, meaty and spicy goodness. That is such a cheap way to have a treat or cheat night instead of forking out for a takeaway pizza. In no way am I saying no to a takeaway pizza but sometimes we cannot afford to splurge out on something that is effectively going to be eaten in a fairly short amount of time. Now obviously the amount of cheese oozing from the pizza on the box is a bit of a stretch to what you actually end up with but that is pretty much the case for all food so we cannot hold it against Mcennedy’s at all. But the amount of ingredients on the pizza is actually really decent. 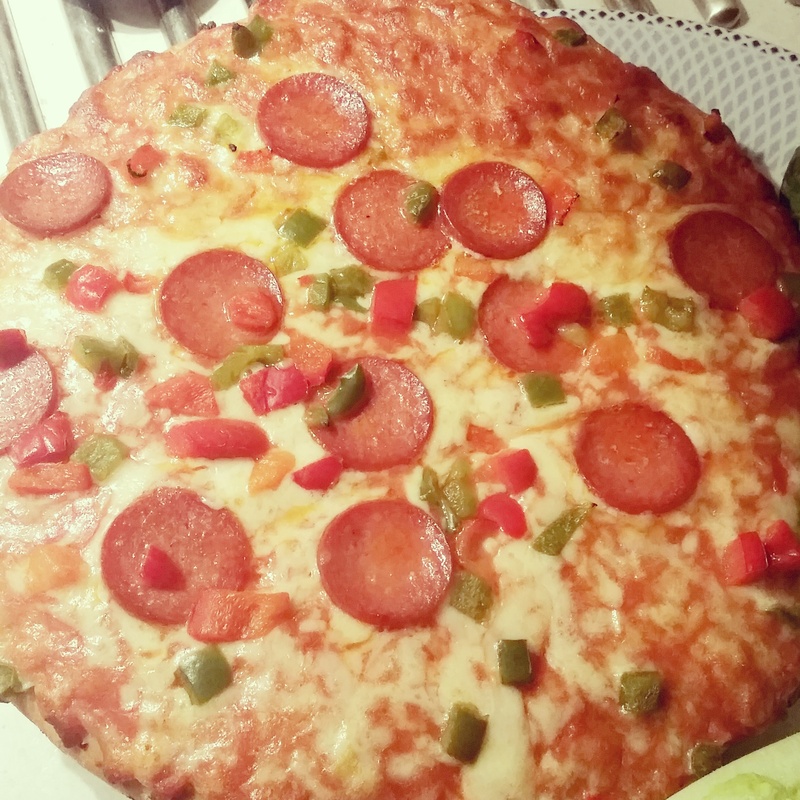 You can easily cut this pizza into quite a few slices and still get both some spicy pepperoni and little chunks of different colours of bell pepper. It also has a lot of tomato sauce on and cheese to help give it extra flavour but also making sure that it is not dry or ended up overly crunchy during cooking. The spicy element is noticable but not overpowering. If you are a big lover of serious heat then you would be disappointed with this but if you like something with a little small kick then this could work. I think it would not be too much for children that are used to a tiny bit of spice and if they find it too much it is easily muted with some mayonaise (as I found out when some for my salad got onto the pizza). It takes 16-20 minutes to cook from frozen and after about 18 it was throughly cooked and warm, the edges were hardening a little but everything was still soft to eat so there were not any bits hurting the roof of the mouth or getting stuck behind teeth (one of my biggest issues with thin based pizzas is how quickly they crisp up and how that often results in hurting my mouth). The other great thing about getting a pizza from a store means you know that the amount of ingredients on each one is much more likely to be equal and precisely calculated rather than at the control of a person making it. But as well as that you can check much easier and quicker the nutritional value to figure out how to eat for the rest of the day or how much of it you want to eat or serve. Besides being able to have something like this in the freezer as an emergency meal is always great and requires minimum effort. Sure the ingredients are not the greatest and it is perhaps not a ‘healthy but naughty’ treat in terms of being balanced but for 89p it is not going to hurt once in a while. 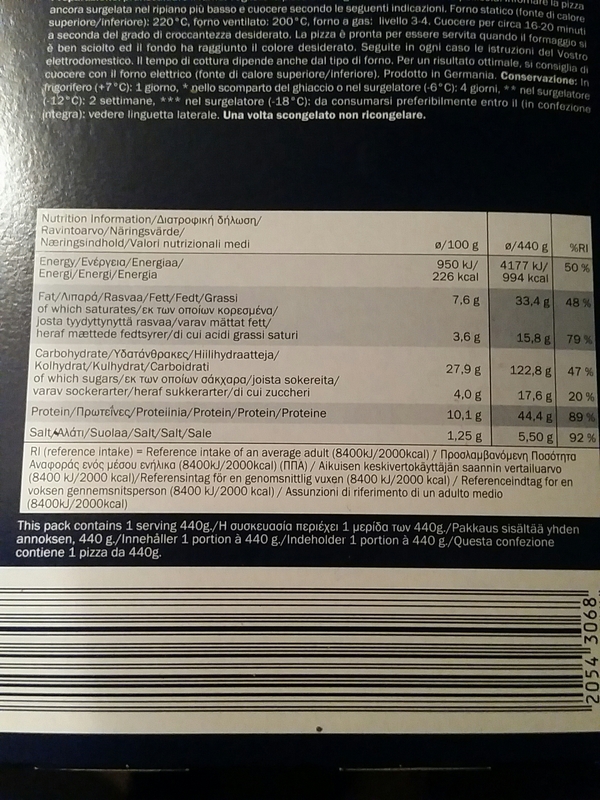 The availability will vary from Lidl store to store but the one we go to regularly has these available so if somewhere stocks them once they will probably have them time and time again. This entry was posted in Food and Drink, Product Reviews and tagged cheap, cheat, Cook, cooking, eat, eating, fakeaway, food, food blog, food blogger, food bloggers, food review, lblog, lblogger, lbloggers, lidl, life, Lifestyle, lifestyle blog, lifestyle blogger, lifestyle bloggers, meat, pepper, pepperoni, pizza, product review, quick, review, simple, spicy, takeaway, tasty, thrifty, treat, vegetables, yummy. Bookmark the permalink.